Thank you for your interest in Stones & Streams. Stones & Streams, LLC is a small company focused on exceptional quality watershaping and stonescaping in the Triangle and Piedmont areas of North Carolina. The objective of quality landscaping, including hardscapes and water features, should not only be to significantly improve the usability and enjoyment of your property but to also increase the value of your property beyond the cost of the improvement. "Watershaping" is the process of creating expressive and pleasing water features (natural or formal) as a complement to any indoor or outdoor space. 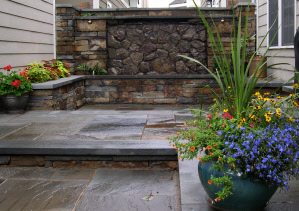 "Stonescaping" is the process of working with natural and manufactured stone and concrete products to create useful, enjoyable, and visually appealing outdoor spaces. Visit our Featured Projects page to view multiple images of some of our more complex projects along with design and installation commentary.